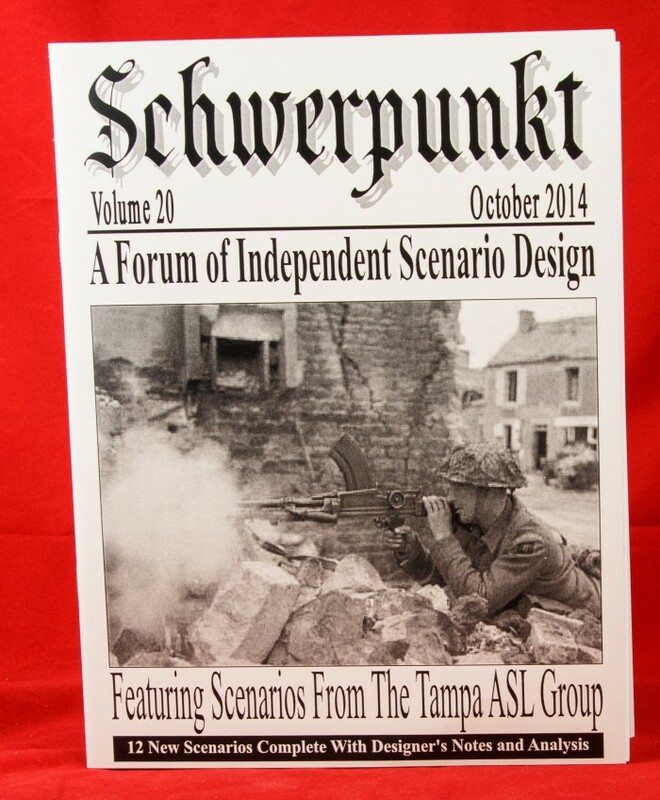 The release of Schwerpunkt Volume 20 at ASLOK 2014 marked a milestone of sorts, if a milestone with an asterisk. The date marked the 20th issue of Schwerpunkt to be released, though not quite the 20th anniversary, which will occur next year, as Volume 5 and 6 were both released during the same year. Still, 20 issues of a major ASL publication, each equivalent to a scenario pack, is nothing to sneeze at. A glance through those 20 issues (or 20 glances, as the case may be) reveals that Schwerpunkt has been nothing if not consistent. Indeed, unchanging might even be a better word. 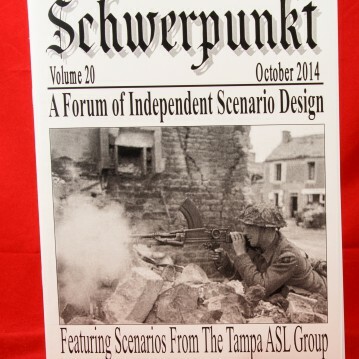 Each issue of Schwerpunkt contains one main article and, sometimes, a secondary article, 12 scenarios, and players’ and designers’ notes for those scenarios. 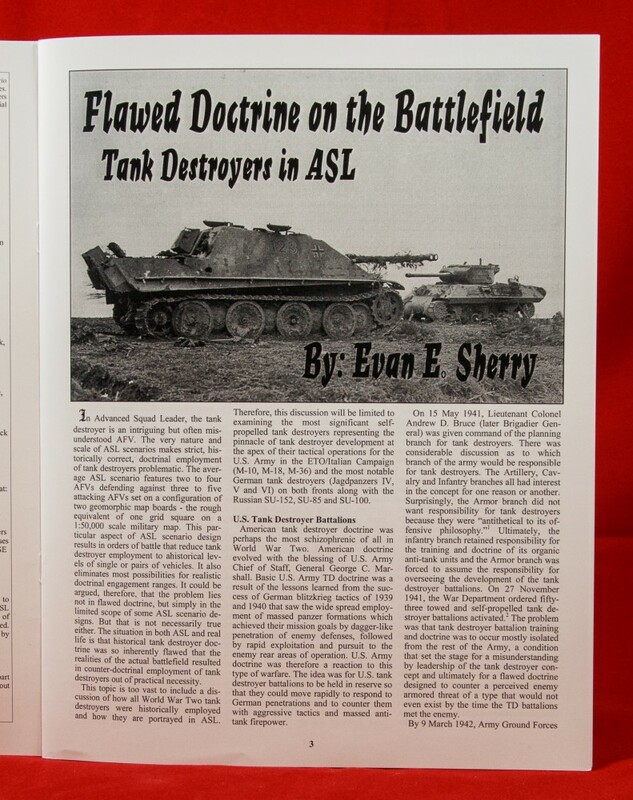 This issue contains just one article, by publisher Evan Sherry, on tank destroyers. The article combines the history and doctrinal use of American, Soviet, and German tank destroyers along with some tactical tips for their use. The 12 scenarios depict a variety of actions, including France 1940 (British vs. Germans), Belgium 1940 (Belgians vs. Germans), New Guinea 1942 (Australian vs. Japanese), Soviet Union 1941 (Soviets vs. Germans) and 1943 (Soviets vs. Germans), China 1937 (Chinese vs. Japanese), Luxembourg 1944 (Americans vs. Germans), Germany 1945 (Soviets vs. Germans), Netherlands 1944 (Americans/British vs. Germans), Hungary 1944 (Soviets vs. Hungarians) and 1945 (Soviets vs. Germans), and France 1945 (Americans vs. Germans). The fact that half of the scenarios take place in 1943 or earlier is a bit unusual, though welcome, as Schwerpunkt scenarios mostly tend to be set in 1944-45. Something that is even more unusual is the typical scenario size. Only 2 of the 12 scenarios could be considered small in size; the remainder are either medium or large (in basically equal numbers). In his “words from the editor,” Evan Sherry states that “a change of direction in our scenario designs required even more playtesting than usual.” This seems to have been a reference to the larger scenarios of Schwerpunkt Volume 20. Many of the scenarios would simply not be suitable for tournament play. Four scenarios have OBA (a somewhat high proportion for Schwerpunkt), but no scenarios use Air Support or Night rules. SSRs are few and far between for most scenarios, with about a third of the scenarios having nothing more than a single SSR denoting the environmental conditions. One scenario uses an ASLSK board: scenario SP233 (Easy Come Easy Go) uses ASLSK board p from Beyond the Beaches: ASL Starter Kit Bonus Pack #1. 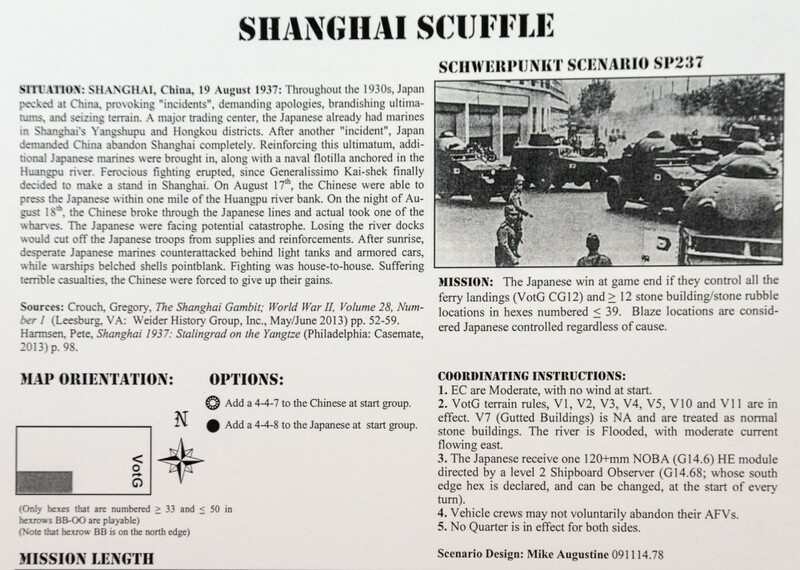 Another scenario, SP237 (Shanghai Scuffle), uses the historical map from Valor of the Guards to represent a bit of Shanghai’s riverfront, the first time that Schwerpunkt has ever used a non-geomorphic map. This is not the only VotG “import.” The pythonic SP238 (Inherent Systemic Violence) uses 6-2-8 NKVD counters from Valor of the Guards. The scenarios use the following maps/boards: VotG, 17, 20, 36, 43, 44 (2), 46, 49, 51 (2), 54, 56, 57, 58, 59, 62, 63, 64 (2), 65, 66 (2), 67 (2), p. As one can see, required boards are dominated by geoboards released since 2007. SP230 (The Rimling Circus). The word “Rimling” alone will tell ASLers what they can find here: Jagdtigers (cf HP3 [Rimling Round Up] in Hero Pax 1). This scenario represents one of several very “meaty” scenarios in this issue of Schwerpunkt. It uses three full geoboards, which is quite rare for Schwerpunkt. 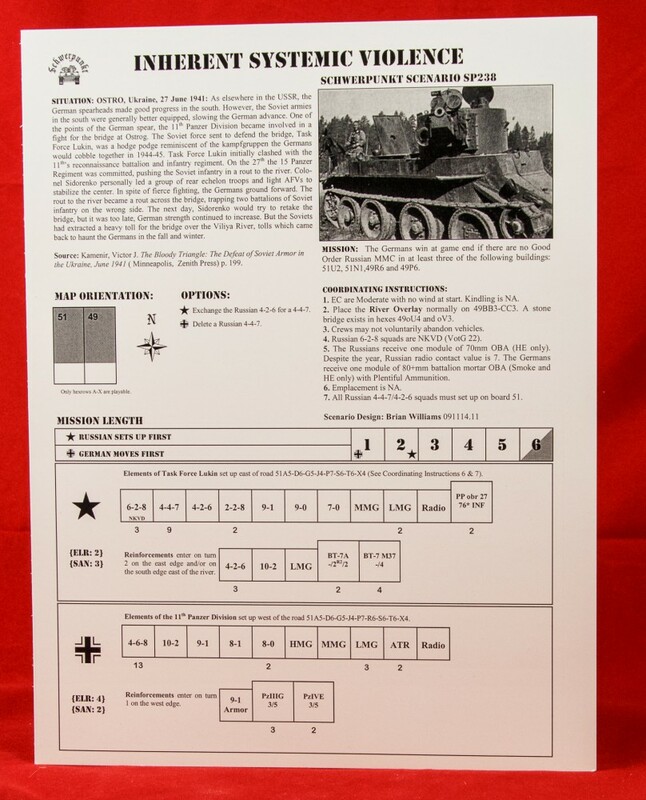 The 5.5 turn “Operation Nordwind” scenario pits 18 Waffen SS squads, loaded with SW and accompanied by 10 AFVs (including 3 Jagdtigers), against 12 elite U.S. squads, 3 guns, and 6 AFVs. Both sides also get OBA. The Germans win by controlling 2 multi-hex wooden buildings, but must also have at least one mobile JgPz VI on the board, which is no sure things (in fact, it means that the German player may have to keep one such vehicle continuously in motion). The array of German AFVs is daunting, but they won’t do much good of the American player can decimate the German infantry. SP232 (The Krutoy Log Roll). This horribly-named scenario is another “meaty” entry by Schwerpunkt, using 6 half-boards to represent a German attack during Kursk. It features 21 4-6-7 German squads and 10 AFVs (3 of them halftracks) against a Soviet position defended by 17 4-4-7 squads, a ton of SW, 3 guns, and 4 SU-122s. The wealth of 4-6-7s and 4-4-7s give off a bit of that old “Squad Leader” vibe. To win, the Germans must clear the Soviets from at least three of four areas. SP231 (Galician Persuasion). This is a medium-sized Soviet-Hungarian action that pits 15 elite Hungarian squads and 6 Zrinyis against 10 Soviet squads aided by 3 T-34s and 2 guns. Depending on player speed, it may just squeak in as tournament-capable. The Hungarian attack (complete with an FT and DC) adds a bit of exoticism, while the forces offer the chance for a nice combined-arms action. SP236 (Hammer Time). This scenario is unusual in that it is a very rare scenario featuring Belgian troops. The Belgian Army was quite large and engaged in a considerable amount of hard fighting in 1940, but accounts of this fighting in English are so few and far between that there are hardly any scenarios that involve Belgian troops, and the majority of such scenarios that do exist only feature a single small unit, the Chasseurs Ardennais. So this scenario, even if it is rather vague about its Belgians (“elements of the Belgian 1st Corps”), is a rare and welcome opportunity to play this Minor Allied force. This action is a medium-sized German combined arms attack, pitting 10 German squads and 7 AFVs against 9 defending Belgian squads, one gun, and 6 AFVs (French cavalry, coming to the rescue, essentially). So this scenario offers the chance to get in some hot Belgian action as well as to engage in a little 1940 tank fighting. What more could one want? SP239 (Nankai Shitai). This scenario is a tiny (3.5 turn) PTO action featuring Japanese and Australians. It features a tiny Japanese attack with a potential tiny Australian counter attack. It is the sort of scenario that Paris Hilton might carry around in her purse. Probably best played twice in a row, switching sides. Very quick action. SP240 (Quiet Desperation). The other toy-sized scenario in Volume 20 is this British-German France 1940 action, pitting 6 German squads and 2 Pz IIAs against 5 British squads with 2 French 37mm INF sw. It is a throwback scenario that could easily have appeared in Schwerpunkt Volume 1. SP237 (Shanghai Scuffle). Because of its use of the Valor of the Guards map, SP237 is one of the more exotic Schwerpunkt scenarios produced. It is also a chance for some nice Chinese-Japanese city fighting. This Japanese attack situation features 11 elite Japanese squads accompanied by 6 AFVs striking at 15 elite Chinese squads with a Gun and 3 AFVs. The Japanese get some NOBA. Several VotG terrain rules are in effect. To win, the Japanese must control ferry landings, plus control (or burn) 12 stone building locations. Overall, Schwerpunkt Volume 20 is one of the most attractive-looking (in terms of scenarios) to come out in several years. It is definitely worth a look.